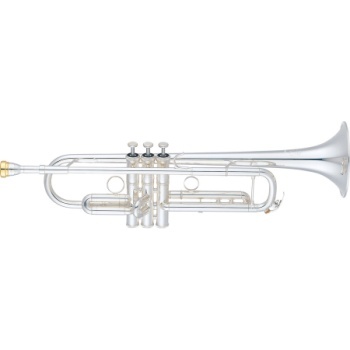 This Xeno Bb trumpet model features a reversed leadpipe and yellow brass bell for quicker response and playing agility. The combination of a heavy mthpiece receiver and removal of the third valve water key results in a superb balance of playability and tonal quality. With this model, musicians will be able to produce a firm sound in all dynamic ranges, from delicate pianissimo to powerful fortissimo. NEW BELL DESIGN: A new bell design contributes to optimum resistance for a powerful tonal core and more accurate slotting. The new design also enhances playability in the upper registerge. THINNER VALVE CASING AND PISTONS, MODIFIED ANGLE OF BRANCH TUBE (KNUCKLE): Thinner valve casing and pistons, as well as the modified angle of the branch tube (knuckle), result in improved response and provides the performer with an ideal blowing resistance. 1ST SLIDE BUTTON: The button on the 1st slide serves to fine-tune the blowing resistance for optimal control.